Road route from Mumbai to Aurangabad pass through Beautiful Hills and some of the most famous Religious Places in India. The various Road Map and Road Route from Mumbai to Aurangabad, Ajanta and Ellora are listed below. There are multiple ways of travelling by road from Mumbai to Aurangabad and back. Each route has its pros and cons. There are places of religious and tourist interest along all the road routes from Mumbai to Aurangabad. TIP: This writer recommends the first 2 routes (Mumbai-Pune-Ahmednagar-Aurangabad and Mumbai-Malshej-Ahmednagar-Aurangabad) as the BEST ROAD ROUTE from Mumbai to Aurangabad. TIP: The Jan Shatabadi is a Fast, Air-conditioned train. Travel time from Mumbai to Aurangabad is around 6.5 hours. This writer recommends Jan Shatabadi Train for travel between Aurangabad and Mumbai. In addition to the Shatabdi train, there are other convenient trains that take around 7 hours. This is the FASTEST Road Route from Mumbai to Aurangabad. There are shorter routes between Mumbai and Aurangabad, but this is the Fastest because of the Mumbai Pune Expressway. The Expressway road from Mumbai to Pune is excellent. Even though Ahmednagar and Aurangabad are two important industrial centers, the State Highway (SH60) connecting them is surprisingly patchy in places. Comparing the condition of the road on this route versus the other routes, this is the Best Road Route from Mumbai to Aurangabad. 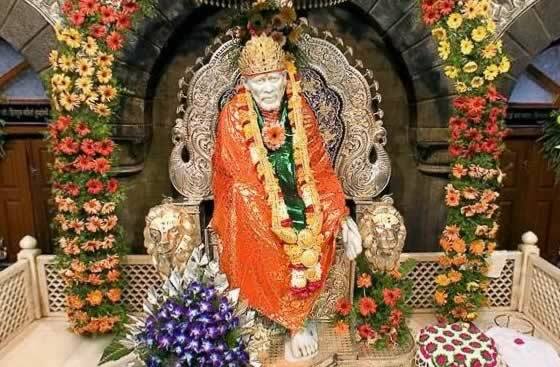 NOTE: Distance between Aurangabad and Shani Shingnapur is 84 Km (52 Miles), Ahmednagar and Shani Shingnapur is 35 Km (22 Miles) and between Shirdi and Shani Shinganapur is 60 Km (37 Miles). This is the MOST SCENIC ROAD from Mumbai to Aurangabad. 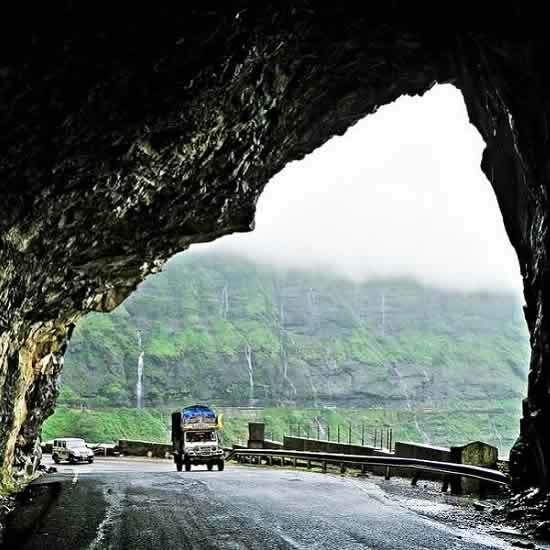 This road passes through the beautiful Malshej Ghat in the Sahyadri Western Ghats. 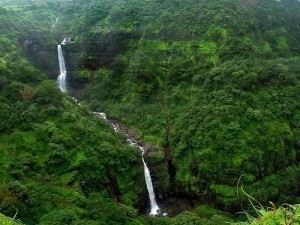 Ideal time to take this route is during the rains, when there are numerous wonderful waterfalls in Malshej Ghat. Winter is also a good time for this route. During winter Flamingoes, and other migratory birds, visit the area around Pimpalgaon Joga Dam, which is East of Malshej Ghat. Most part of the road leading to Malshej Ghat, and beyond to Ahmednagar, is in fairly good condition. ROAD ROUTE FROM MUMBAI TO AURANGABAD: Mumbai to Thane, Igatpuri (National Highway 3, also known as NH 160), Ghoti Toll Naka (NH3/NH160), Sinnar (Mumbai-Aurangabad-Nagpur Highway), Vaijapur (bypass Shirdi near Kopargaon), Waluj (SH 30), Aurangabad. TOURIST ATTRACTIONS ON THIS ROUTE: Shirdi Sai Baba Temple, Igatpuri Hill Station, Dhamma Giri Vipassana International Academy at Igatpuri, Trimbakeshwar Shiva Temple (1 of 12 Shiv Jyotirlinga and the origin of River Godavari), Western Ghats near Ghoti, ancient Gondeshwar Temple at Sinnar. The road from Mumbai to Shirdi is a good road to drive on, except for some parts of the Ghoti – Sinnar highway. The area between Ghoti to Sinnar has not yet fully developed, so there are lovely wide open stretches of plains and hills. There are windmills along this road. The view of the majestic Western Ghat Mountains near Ghoti is awe-inspiring. This stretch of the road matches the Malshej Ghat Road for scenic beauty. The Shirdi to Aurangabad road is a state road and is not a good road to drive on. So even though this is the SHORTEST ROAD ROUTE from Mumbai to Aurangabad, this is NOT RECOMMENDED because of the poor condition of the road. 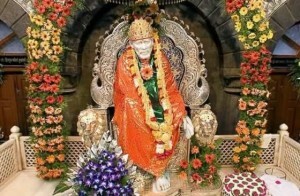 Take this route only if you wish to visit the Shirdi Saibaba Temple. Travellers wishing to visit Ellora Caves first and then Aurangabad, can take a detour to Ellora from either Vaijapur or Lasur. ROAD ROUTE FROM MUMBAI TO AURANGABAD: Mumbai to Thane, Nasik (Mumbai – Agra National Highway, NH 3 or NH 160), Sinnar (Mumbai-Aurangabad-Nagpur Highway), Vaijapur (bypass Shirdi near Kopargaon), Waluj (SH 30), Aurangabad. TOURIST ATTRACTIONS ON THIS ROUTE: Shirdi Sai Baba Temple, Igatpuri Hill Station, Dhamma Giri Vipassana International Academy at Igatpuri, Trimbakeshwar Shiva Temple (1 of 12 Shiva Jyotirlinga and the origin of River Godavari), holy city of Nashik (places of interest include “Panchavati”, “Ramkund”, “Kalaram Temple”, “Muktidham”), ancient Gondeshwar Temple at Sinnar. Instead of going East from Ghoti to Sinnar, travellers can drive up to Nasik and from travel to Sinnar and then Shirdi and Aurangabad. The only advantage of this road as compared to the previous route is that motorist gets to drive on the excellent Mumbai – Agra National Highway until Nasik. Unless the traveller wishes to visit the holy places of Nashik, Trimbakeshwar and Shirdi, one can avoid this route. ROAD ROUTE FROM MUMBAI TO AURANGABAD: Mumbai to Thane, Igatpuri (National Highway 3, also known as NH 160), Ghoti Toll Naka (NH3/NH160), Sinnar (Mumbai-Aurangabad-Nagpur Highway), Sangamner (Pune Nashik National Highway 60), Newasa (State Highway 44), Aurangabad. TOURIST ATTRACTIONS ON THIS ROUTE: Shirdi Sai Baba Temple, Igatpuri Hill Station, Dhamma Giri Vipassana International Academy at Igatpuri, Bhandardara, Trimbakeshwar Shiva Temple (1 of 12 Shiv Jyotirlinga and the origin of River Godavari), Western Ghats near Ghoti, ancient Gondeshwar Temple at Sinnar. The main advantage of this route is that the scenic hill station of Bhandardara is a short detour on this route. There is not much to recommend on this route. TIP: As a general rule the National Highway Roads are wider and better maintained. Maharashtra State Highways are a bit of Pot Luck – sometimes they are good and sometimes they can take a toll on the vehicle and passengers. This map has all 5 road routes from Mumbai to Aurangabad. In addition to travelling in a private car from Mumbai to Ellora, Ajanta and Aurangabad, travelers can also travel via plane, train and bus. Currently Jet Airways and Air India have direct non-stop flights between the cities of Mumbai and Aurangabad. The fastest train between Mumbai to Aurangabad is the Jan Shatabdi Express (Train Number 12071), whose travel time is 6 hours and 10 minutes. This train starts from Mumbai Dadar Station (Station Code “DR”) at 2:00 pm. The Aurangabad to Mumbai Dadar Jan Shatabdi Express train (Train Number 12072) leaves Aurangabad Station (Station Code “AWB”) at 6:00 am and takes 6 hours and 30 minutes to reach Dadar. Trains from Mumbai to Aurangabad travel via Thane, Igatpuri, Nasik, Manmad and finally to Aurangabad. There are 3 other trains between Mumbai and Aurangabad, which take around 7 hours. Maharashtra State Transport Buses and Private Operated buses ferry passengers between Aurangabad and Mumbai. Private Operators offer air-conditioned luxury buses. Typically these buses take between 10 to 11 hours to travel between these cities. There are 12 Shiva Jyotirling Temples in India. Of these 5 are in Maharashtra. Of these 3 are around Aurangabad (Grishneshwar Jyotirlinga Temple, Aundha Nagnath Jyotilinga Temple, Parli Vaijnath Jyotirlinga Temple). The remaining 2 Jyoti Linga (Trimbakeshwar Jyotilinga Temple and Bhimashankar Jyotilinga Temple) on the route from Mumbai to Aurangabad.